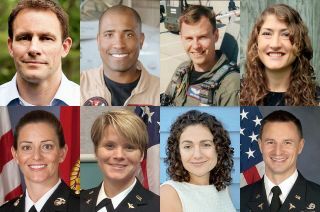 NASA new astronaut candidates (from top left to bottom right): Josh Cassada, Victor Glover, Tyler “Nick” Hague, Christina Hammock, Nicole Mann, Anne McClain, Jessica Meir and Andrew Morgan. Ann McClain's mother was in her front yard rose garden when her daughter called with the news. "You'll never forget this moment," McClain, a 34-year-old major in the U.S. Army told her mom. "I've been selected as an astronaut candidate." "She sounded like she had the same reaction as I did," McClain recalled in a video interview released by NASA. McClain and seven others were announced Monday (June 17) as the United States' 21st class of NASA astronaut candidates ("ascans"). The four men and four women will report to the agency's Johnson Space Center in Houston in August to begin two years of basic training. Victor Glover, a 37-year-old lieutenant commander in the U.S. Navy pinched himself after getting the call to report for NASA astronaut training. Currently assigned as a Navy Legislative Fellow in the U.S. Congress, he and his wife, Janet, had been waiting for word as to where he would be going next. "I called her and I was able to tell her that now we know where we are going, it will be to Houston," he said. "And she was ecstatic." Tyler "Nick" Hague hadn't yet told his parents, but knew they would be excited. His brothers' reaction? Well, that was bound to be different. "My brothers, as they always do, will give me a hard time and tell me the challenges ahead in the training program," said Hague, a 37-year-old lieutenant colonel in the U.S. Air Force and the current deputy chief of the Joint Improvised Explosive Device Defeat Organization. "But everybody is going to be excited." Other than being thrilled for their selection — the ascans were chosen from among more than 6,000 applicants, the second largest turn out in NASA's history — the eight new candidates said they were really excited at the prospect of contributing to humanity's exploration efforts. "I'm really excited about being a part of something much bigger than me and working alongside some of the world's best minds, who, thankfully for us, feel the same about being a part of something much bigger than them," said Josh Casada, 39, a high-energy particle physicist and a former naval aviator. "From my perspective, exploration is the foundation of the human spirit, whether that exploration is at the subatomic level or on the nano scale or even the cosmic scale," Casada added. "I think if society is not exploring, we are really just kind of sustaining, and to be able to contribute to that exploration in any small way is really exciting." Glover expressed similar sentiments, stating he is excited to be a "part of kindling America's passion for aerospace and space." "There is something special about flying, and especially flying in space, that it just draws people's fascinations and passions," he said. "Being a part of that is the thing that I think excites me the most." "I really look forward to being able to directly contribute to the human spaceflight program," said Christina Hammock, 34, who serves as a National Oceanic and Atmospheric Administration (NOAA) station chief in American Samoa. "I really strongly believe in both the practical aspects of the research being conducted, as well as the larger picture of the human spaceflight program bringing us forward as a human race and uniting us in exploring the universe." Before they can hope to launch into space though, the candidates will need to first pass basic training. Over the next two months, the eight ascans will need to relocate to Houston, where they will soon join the NASA community at Johnson Space Center. "I am really looking forward to the people down at NASA and working for that really great organization," 35-year-old Nicole Mann, a major in the Marine Corps, said. "I've had the opportunity to go down [to Johnson Space Center] a couple of times for a visit and really it is just the energy and the excitement." "The professionals there and our international partners — everybody working towards a common mission, towards science, exploration and that goal of all of humankind — I'm looking forward to being a part of that very important team," she said. Andrew Morgan, a 37-year-old emergency physician and flight surgeon, shares Mann's admiration for the people at NASA. "I definitely felt drawn to being surrounded by the people I have encountered at NASA and being part of the astronaut office and being part of the astronaut corps," Morgan said. "It was just a tremendously talented group of people — and to be a part of that, I knew that would be something special." Jessica Meir said she too, was excited to be part of the NASA team, but was also looking forward to the training she and her seven ascans will soon begin. "I have my private pilot's license but I am really excited about going to Pensacola [Fla.] for real flight training in jets. That is something that will be really, really incredible for me," the 35-year-old assistant professor of anesthesia at Harvard Medical School in Boston said. "I am also looking forward to the international component. I really enjoy studying foreign languages and cultures, and so the emergence in the Russian culture and society that we will have as part of the International Space Station and the other international partners as well, I am really looking forward to that."